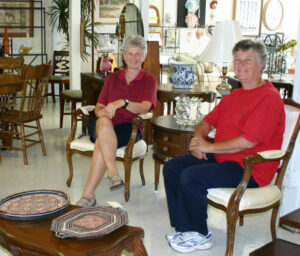 With 35 years in the furniture business, Margery Smith and Rita Wagner of ‘The Strippers!‘ opened “Bits & Pieces – Furniture & Décor Consignment” store 17 years ago, right across the street on Gage, Kitchener and are committed to bringing you the very best in quality used furniture and décor items. Their passion for furniture refinishing and preservation led to recognizing a need for a high quality consignment store where you would be able to find well manufactured, quality and gently used furniture. With a great appreciation and respect for the fine artistic furniture and pieces of days gone by, it seemed a natural progression for Marge and Rita to take another step into a complimentary endeavour to their already existing business. After having established themselves as ‘The Strippers!‘ restoring and repairing all types of design and various styles of furniture, it was a natural progression to go from a workshop to a furniture shop. In 2001, they very proudly opened “Bits & Pieces Furniture & Décor” a consignment store offering a vast selection of high end gently used furniture and household items at unbelievable prices! With the greatly received success of “Bits & Pieces Furniture & Décor” they doubled their space in 2007 which enabled them to “double” their inventory of consignment items! You will simply love shopping in this new expanded space (same location) where so many beautiful and unique treasures are showcased!